After watching episode one of Top Chef: Just Desserts and seeing the “scenes from next week” it looked like there might be a few loose cannons on the cast to provide plenty of drama over the coming weeks. That didn’t seem to be the case with the seemingly level headed contestant Eric Wolitzky. DessertBuzz caught up with Wolitzky who is currently a pastry chef at Baked in Red Hook Brooklyn in New York City. 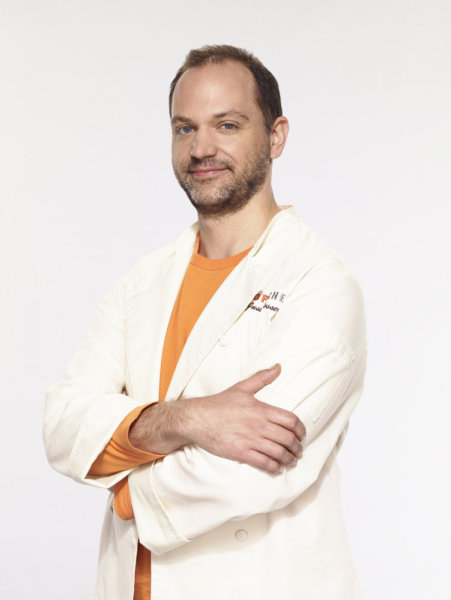 Eric is originally from Rochester New York and received his culinary training at the French Culinary Institute. Go here to read his official bio on the Bravo site. DessertBuzz: This city can be a pretty tough critic when it comes to judging food do you think it helps to have a thick skin in your line of business? Eric Wolitzky: You have to be careful. I mean I have to stay true to myself. I definitely make sure I don’t read everything that’s written about me. DB: Which of your signature dishes do New Yorkers seem to respond to? 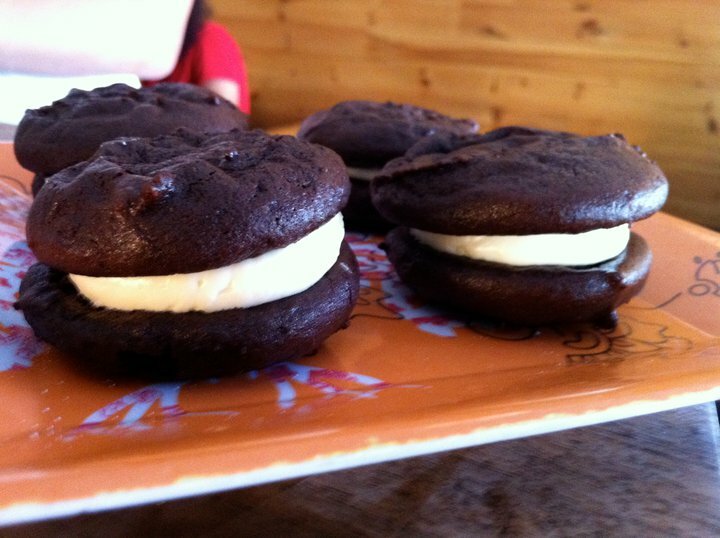 EW: Whoopie pies. We started making them 2 years ago in flavors like banana, peanut butter and pistachio and they really fly off the shelves. We just make really simple stuff, really well, with the best ingredients. DB: A well known pastry chef once told me that bakers and Pastry chefs are two completely different animals. You seem to seem to be more of a baker do you think this will help you in the Top Chef: Just Desserts competition? EW: I work with a lot of speed and precision and there’s a often a lot of pressure. I don’t have to worry as much about presentation and with baking there isn’t as much focus on all the components, for example, I don’t do a lot of sauces, as Pastry chefs do. Most bakers have their own individual style and my focus is always on flavor – how can I make what I am baking taste the best? BD: What are some of your favorite Desserts in New York City? EW: Usually if I can get a chance to go out, I like to do “breakfast-like” desserts. Maybe a breakfast item from Financier or I’ll try to find a perfect scone or puff pastry – I like the simple desserts but really nicely made and still simple. DB: Did you see the DessertBuzz New York scone round up? EW: Yes, I saw that I have to get to some of those. DB: If you had to eat one chocolate chip cookie besides Baked or Royale where would it be from? EW: Recently, a friend’s mother gave me a chocolate chip cookie that I didn’t eat right away. I thought, god I just want a Levain cookie instead of this one! It was very thin with a well done crust [the exact opposite of a Levain cookie – Ed]. But then I defrosted it and ate it and I have to say it was the best chocolate chip cookie I have had in a long time- just a pure home made cookie. EW: You know my experience is so different – I really looked at past seasons of Top chef from afar and thought – would I be able to do some of those challenges? DB: A lot of people think being a pastry chef is very glamorous. Is it? EW: Oh my god no! I work in the middle of nowhere (Red Hook Brooklyn) I get up at 5:30 and take the subway and we work really hard – there aren’t many breaks either. DB: Do you ever get a chance to experiment in an empty kitchen and just play around to create a new item? DB: Congratulations on making it past the first episode. EW: Yeah, I was really happy to keep it simple and happy about what I did. When I made that brownie [Eric made a Spiced Brownie with Ancho Chile, Ginger and Cinnamon Ed], I was in my zone. I just really love to bake. We’ll be following Eric on DessertBuzz as the season progresses. Go here for the episode one recap. Baked is one of the best places in NY, period. I especially like their chocolate/peanut butter squares and the cupcakes. @FN If only other readers knew what an endorsement it is to have you say you like their stuff. The chocolate squares are definitely one of the best things in the city. That maybe true but you are a tough critic. BTW, I has some macarons by the Jacquy Pfeifer from the French Pastry School in (he was in NYC) and they were the best I ever had (in US). Pics coming soon.